Role: Helping to build toilet facilities for school children and rebuild and renovate the homes of the poor or those affected by disaster. 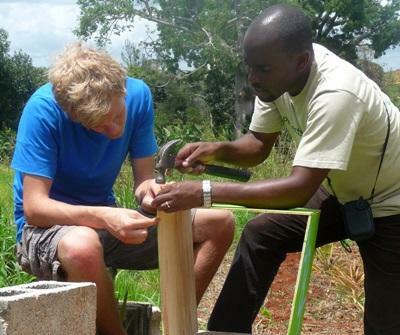 Volunteers are needed in Jamaica to work on a Community Building Project, helping to build toilet facilities in schools. Projects Abroad Jamaica has been working with the Ministry of Education in the region to reduce the number of pit toilets in primary schools as these are unsafe and unsanitary for the children. There are 40 schools in the region that need this type of upgrade and this will benefit hundreds of children. With your help we can assist in addressing this crucial need in schools in Manchester. According to reports received from the Ministry of Education, there is an urgent need to address this situation given the various negative impacts on the children. These include skin rashes, infections, children becoming sick due to poor sanitary conditions and children almost falling into the pits. The aim is to have newly built toilet facilities so that the safety and security of the children is not compromised. Some schools do not have running water, and if they do, the system that exists is either outdated or in need of urgent repair. 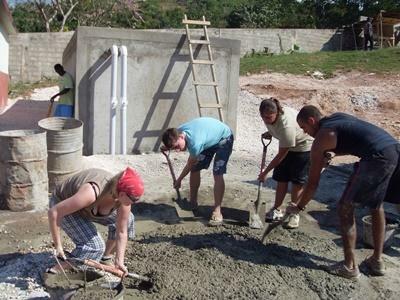 Volunteers on the Building Project in Jamaica work alongside an experienced local builder as part of a committed and dedicated team digging the foundations, mixing mortar, digging pits, laying blocks and carrying sand, cement, water and stones. Building volunteers are also involved in a quarterly outreach scheme to help to renovate a house for a needy individual who may have been affected by fire, flood or a hurricane or may be living in a unacceptable conditions. This collaboration between Projects Abroad Jamaica and the Ministry of Education will result in improving the standard of living of those in need. You don’t need a degree in engineering or to be a skilled tradesman to join us, but if you do possess any of these skills, they will be put to good use. Building volunteers should be prepared to work hard and get involved in the whole range of building tasks. Volunteers live with host families in Mandeville and are provided with support from our Projects Abroad staff in Jamaica. You can join the Building Project in Jamaica for two or three weeks if you don't have time to join us for four weeks or more. This project has been selected by our local colleagues as being suitable for short term volunteering for both the placement and you, the volunteer; however, please be aware that you may not be able to make the same impact as someone volunteering for a longer period.